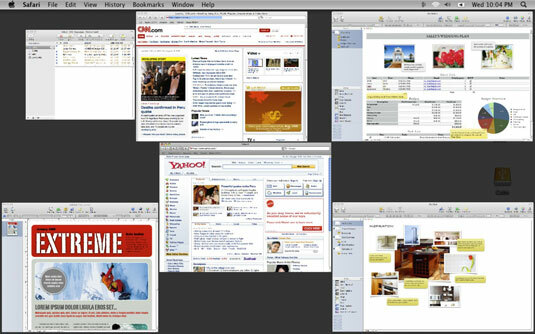 You can use a handy feature called Exposé to organize your opened windows on your Mac. Exposé gives you a fast, convenient way to organize your windows. You don’t have to move, resize, or minimize each window individually. You can shrink all windows to the size of thumbnail images so that you can see and choose the window you want to use. Pressing the F9 function key shrinks the windows for you. Pressing F9 shrinks all open windows into thumbnails. You can display only those windows that belong to the currently active program by Pressing F10. Pressing F10 hides all windows except for the currently active program (the name that appears in the Application menu). You can hide all windows by pressing F11. Pressing the F9, F10, and F11 function keys toggles the display. So pressing F9 initially shrinks all windows as thumbnail images, but pressing F9 a second time reverts all windows to normal size. When windows appear as thumbnail images after you press F9 or F10, you can move the pointer over the thumbnail image and view the file name that appears in that particular window. To switch to a window, click the thumbnail image of that window. 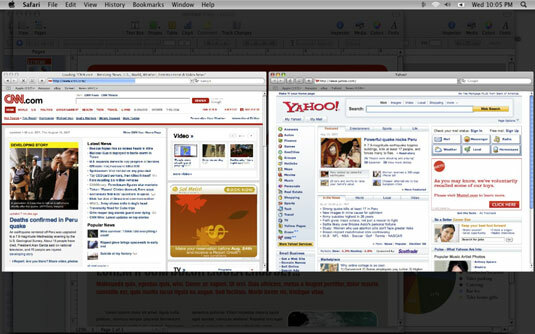 Exposé immediately displays your chosen window (at full-size) on the screen.